We begin our journey at Needles California. Needles is 254 miles north of the Mexican border. Needles was founded in 1883 and incorporated as a city in 1913. The town is split by Interstate 40 running west to east, and US Highway 95 runs north and south. It is situated about 10 miles west of the Arizona border in San Bernardino County. The 2000 Census population was 4,830. The Santa Fe Railroad Company has been the primary employer in Needles since the 1880's. Today much of the influence in the town focuses on the old Route 66, which ran through the center of town. 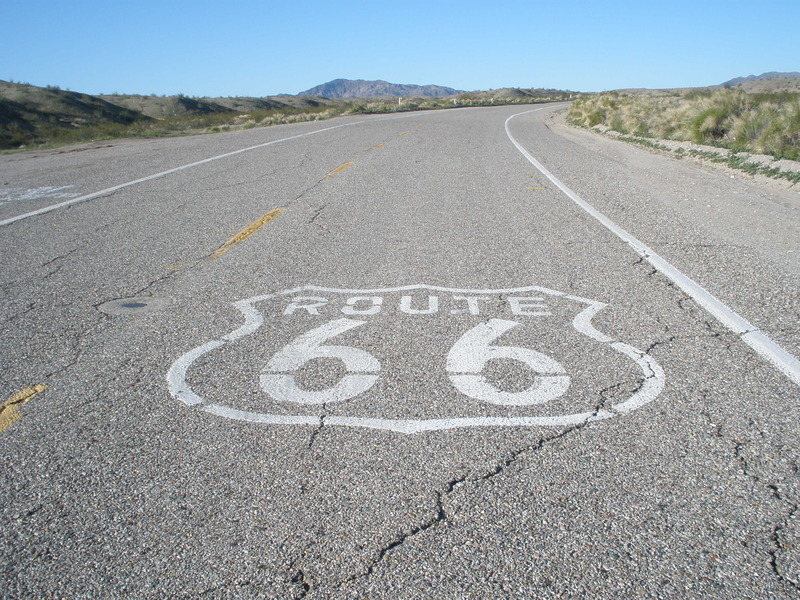 There are many remnants and replicas of the old Route, including 50's vintage buildings and Route 66 legends painted on the roads. The settlement of Needles was founded in 1883. The Atchison, Topeka and Santa Fe Railway Company (ATS&F) was in the process of building a railway to the Gulf of Mexico. When the railroad pushed its way westward to the Colorado River, the town was founded and was originally called "The Needles" after some sharp peaks nearby. The first railroad bridge to cross the Colorado River was built nearby in that year. Railroad tycoon Daniel Murphy and his Irish-born friend Frank Monaghan established the company town. A general store, utility plants and banks were built to support the 300 railroad men working there. Soon, freight cars hauling Southern California citrus eastward were able to replenish their melting blocks of ice in Needles. The town also became a regular stop for the Santa Fe Railroad. In 1906 the railroad station burned to the ground, causing loss of life. 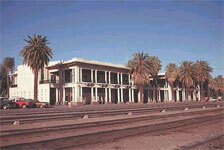 The original station was replaced by a concrete structure in 1908, the El Garces Harvey House. In the mid-1870's, Fred Harvey joined forces with the fledgling Atchison, Topeka and Santa Fe Railroad. Harvey noticed that most trains had no dining cars, and lunchrooms along the route were deplorable. Passengers often had to forage for themselves at stops along the way, finding anything they could nearby. If the passengers weren't back on time, the train often left without them. Harvey hatched the concept of building a network of restaurants along the railroad.  He found a financier in Charles Morse, the superintendent of the railroad who also happened to be a gourmet. Harvey built restaurants with high quality food, cleanliness and first-class service that soon evolved into hotels. By the late 1800's there were Fred Harvey dining facilities every 100 miles along the Santa Fe line, including Needles. Over the next few decades the automobile became more and more the vehicle of choice for travelers. Railway traffic continued over the next few decades, but the automobile was fast becoming the vehicle of choice. The railroad was moving more commodities than people. Travelers along Route 66, many of them Dustbowl refugees seeking a new life in California, still stopped at El Garces when reaching Needles. More and more gas stations, restaurants and motels began sprouting in town. The Harvey House in El Garces finally closed in 1949, and the rest of the building was partitioned off and used as Santa Fe Railway offices. In 1988 the Santa Fe Railroad closed El Garces and abandoned the building. It was threatened with destruction until 1993, when a group called Friends of El Garces was formed. The group petitioned the City of Needles to purchase El Garces, which the city did in 1999. After Hoover Dam was built, the land around Needles became more arable. Agriculture quickly became a leading economic factor in town, but Needles began to suffer economically. First, the diesel locomotive, which was more dependable and maintenance free than the steam locomotive, meant fewer maintenance and repair stops in Needles. Second, Interstate 40 was constructed bypassing much of the town. Tourism began to suffer, and Needles entered a period of decline. 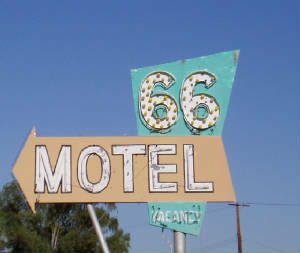 Today Needles is enjoying a renaissance, with many old buildings being restored and travelers re-visiting historic Route 66. The old Claypool Building, with its art deco façade, is currently being renovated and will become the new home for the Palo Verde College Needles Campus in 2008. Work to restore the El Garces structure began in earnest in March 2007. A variety of grants and donations totaling nearly $12 million made restoration possible. When completed, the modern version will feature 50 guest rooms, a restaurant and bar, and office space for a California Visitor Center and the Needles Chamber of Commerce. Rumors persist that some type of unidentified flying object crashed near Needles in May, 2008. 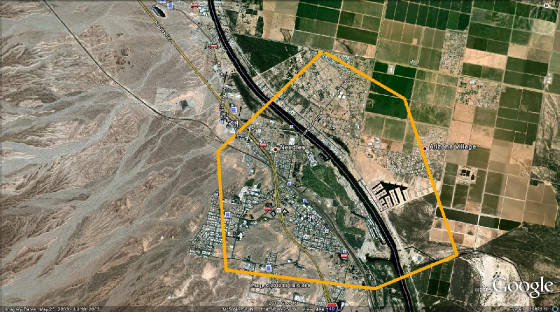 Credible eye-witnesses reported seeing a bright, large glowing cylinder plunge into the Colorado River southeast of town. Very soon thereafter, military helicopters converged on the site and removed the debris. The local news station reported the story, and did a follow up report later. They had tracked down an eye-witness who had seen the object crash into the river, and who had then been subject to scrutiny by military officials. The eye-witness was very reticent to discuss the incident, but did offer that "I don't believe we were meant to see this." In the months after the incident the TV station made several requests for information to several state and federal agencies, but as of yet the incident remains a mystery. Among the civic events held annually in Needles are the Hometown Rodeo and Parade in the spring, a Fun Run-Biker Ride each April, the Fort Mojave Indian Tribe Days and Parade in October, a Solar "Flair" and Route 66 event in November, and an old fashioned Christmas Faire and Parade in December. Needles is located in the eastern Mojave Desert. The triangular area between Barstow, Needles and Las Vegas is sometimes called the "Lonesome Triangle." The Sacramento Mountains are to the west/southwest. The city is named for the pointed peaks to the east in Arizona. Most of the city is within the Colorado Valley drainage area. The Chemehuevi Mountains loom to south, near Lake Havasu. Average daily highs are in the mid-sixties in January, close to 110 degrees from mid-July to mid-September. Average daily lows are in the low 40's in January, in the low 80's in August. Wind-blown sandstorms can happen any time of the year, but are more typical in the spring. The average humidity is very low, below 60% year round. The lowest humidity usually occurs in June (between 15 and 40 percent), while the highest humidity usually occurs in December and January (between 30 and 60 percent). The construction of Hoover Dam upstream from Needles controlled discharges downstream, prevented degradation of the stream banks, and alleviated the natural tendency for the Colorado River to meander. These manmade features reduced the threat of seasonal flooding and redefined the river in this area to, in effect, a "perfect river", or more factually, a "simple river." The unusual and unexpected development of symmetrical, moving sandbars created an aquatic delight for boaters. Camp Ibis is located 21 miles northwest of Needles, near the California/Nevada/Arizona border. Camp Ibis was one of several camps established during World War II to train American troops in desert survival, armored vehicle tactics and gunnery. The Camp was built in late 1942-early 1943, and the first Commander was Major General John S. Wood of the 4th Armored Division. The Army discontinued use of the site in 1944. The Garces-Smith Monument (Cal. State Monument #618) marks the old Indian Trail used by Father Garces in 1776, on his way to San Gabriel. The location is not publicized, but information about it and access permission can be obtained by calling the Cajon Ranger District, San Bernardino National Forest, at 714-887-2576. The Needles Regional Museum is located at 929 Front St. It contains a wide assortment of artifacts, some dating back to the Spanish colonial days. True to its' all-volunteer staff, the museum is closed in August for worker vacations. A local branch of the San Bernardino County Museum is located at 1924 J Street. The Colorado River dominates most of the recreation opportunities in Needles, but there is an array of other diversions for the casual explorer. The Needles Municipal Golf Course overlooks the Colorado River. The original Route 66 can still be driven through town. The Turtle Mountain area offers rock hounding to the delight of the most extreme rock hound. There are four trailheads near two house ruins (formerly called the Lost Arch Inn), leading to deposits of fire agate, jasper, opalite and others. The Dead Mountains Wilderness is located about 16 miles northwest of Needles off River Road. When Frontiersman Jedediah Smith first explored the 54,410-acre wilderness in 1862, he discovered a small spring in a canyon. He named the area Picture Canyon after the petroglyphs he found there. The area was once a cremation site for the local Indian Tribes; hence it is a sacred place for them. The canyon is about six miles long, and ranges in width from 100 feet to as little as 15 feet. Most of the petroglyphs are found around the spring, with most of them facing the south. To get to Picture Canyon, go north from Needles on River Road about 16 miles and look for a rock cairn by the side of the road. Turn west up-wash to the canyon. There are five RV Resorts, one regional park and one campground listed in the Needles Yellow Pages. The Needles KOA is located a few miles northwest of Needles at 5400 National Old Trails Highway. The campsite offers RV sites, tent sites, and one and two-bedroom cabins. 50-amp service is available along with wireless internet (with charges), and the maximum pull-through length is 90 feet. A swimming pool and meeting room are also on site. The Moabi (San Bernardino County) Regional Park is located on the banks of the Colorado River 11 miles southeast of Needles right off Interstate 40. The Park has 35 full-hook up RV sites, 120 water/electrical sites, and two dump stations along 2 ½ miles of shoreline. There are also an unlimited number of tent sites, 24 group camp areas, and long-term (five month limit) visitor rates. The facility has hot showers, rest rooms, a marina and store, public telephone, fire rings, and picnic tables with shelters. Camping, boating, fishing, swimming and water skiing are all offered. Visit their web site at http://www.maobi.com/. The Needles Marina Park is located at 100 Marina Drive. This campsite offers tent camping, sleep cabins, RV hookups (all sites), a store, a mobile home park, boat slips and launch, laundry and showers, a swimming pool and a Jacuzzi. Visit their web site at http://www.needlesmarinapark.com/, or call 760-326-2197. The Rainbo Beach Resort offers 70 permanent mobile home sites, a separate RV site with 66 river sites, full hookups, 1,100 feet of river frontage, a boat launch, a state-of-the-art gym and other amenities. Their web site is http://www.rainbobeachresort.com/, and reservations can be made at 760-326-3101. There are several national hotel chains in Needles, including Motel 6 and Best Western, as well as local hotel/motels like River Valley Motor Lodge, Desert Mirage Inn and Suites, and the historic Palms Motel. Several national fast-food chains are represented in Needles. Sit-down national chains include Denny's and Domino's pizza. Jedro's Wagon Wheel Restaurant is located close to the hotels, and is rated as the best restaurant in town.